After Joan Rivers died last week at the age of 81, a lot of news outlets featured photos of her opulent New York City penthouse. But I kept thinking about the stone and clapboard country house she remodeled in Connecticut. This room really shows her softer side that we didn’t see much in public. She said she liked the white-painted palm tree because it was “silly and whimsical.” A portrait of her with her daughter Melissa hung over the fireplace (by watercolor artist David Remfry). The house sits on more than 75 acres. Visit Architectural Digest for more information and all the photos by Mary E. Nichols. I would’ve chosen the country house, though. What about you? Beautiful home! She &her interior designer did a great job with it. Joan had incredible taste in fashion and design and it really shows in her homes. I love the French country vibe in the kitchen/dining area of the Conn. country house. What I admired most about Joan was her strong work ethic. That lady didn’t know what the word “retirement” meant! As sad as her passing was, I think her daughter is probably grateful that her Mom got to do what she loved until the very end. joan is from the old school so she likes this look. it looks so formal, how could one be comfy ? Thanks for the showing pics of the country home! Definitely my favorite, especially the country manor kitchen and intimate dining room. I do believe that the country house might be the prettiest house I’ve ever seen. So gentle and comforting. And, oh my, the changes are simply unbelievable. 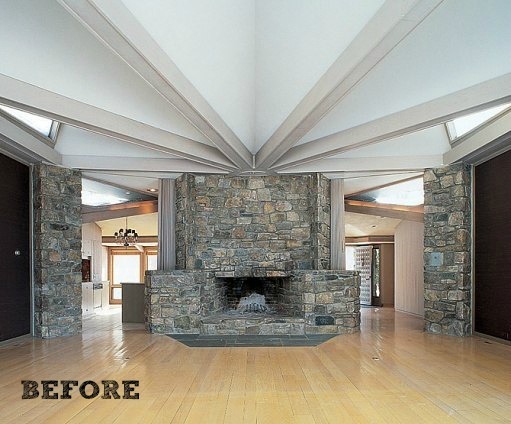 Hard to fathom the ‘before and afters’ are even the same house. I didn’t follow Joan much – her style of humor isn’t what I generally like. But looking at this house, she obviously had a softer side as well. Joan, you will be missed! In her later years, she got a bit obnoxious, but I give her credit for being a super savvy woman. That N.Y. home was too much for me. The country house was a bit more relaxed, but still too fancy for me. Maybe too many things and furniture? Just felt somewhat formal for a getaway place. Wow – that hallway is AMAZING! Painting of your friends’ homes as “seen” through trompe l’oeil windows? What an inspired idea! And the views from the terrace. And the pool with those grass-outlined stoned. An absolutely gorgeous house. Thanks Julia – really, really enjoyed this one! 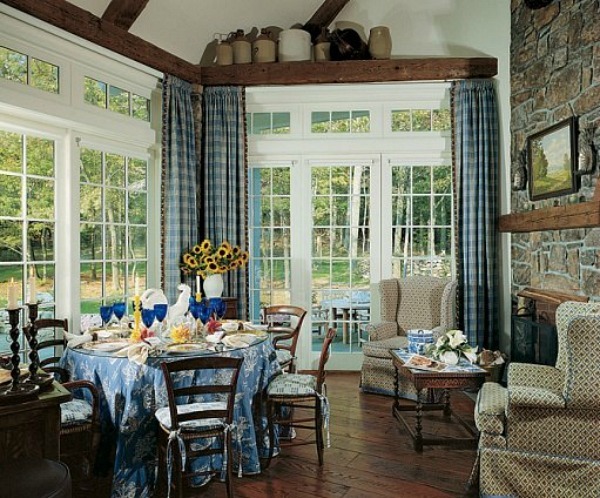 I especially love the blue buffalo check curtains in the breakfast room. That room and the kitchen are my favorites, they’re nice and relaxed without being to pretentious. Joan was a classy woman with great taste! I had never seen the country house in Conn. That is simply beautiful, and I love the “dining room” with the fireplace. The entire home is just stunning. Joan Rivers was a favorite of mine for many, many years. I saw her perform in Atlantic City in the 1980’s and she was great! She will be missed! Rest well, Joan! Julia, I’d love to know if Joan was a big reader. There are so many books piled on tables and such (not just on the book shelves). It could be just for looks, but I’ll love her even more knowing she was a bibliophile and not just gorgeous and funny. Beautiful home. As some others have said, rather formal, but it suits her. She was over-the-top, and so were her homes. She certainly was controversial. Love her or hate her though, you have to respect her incredible endurance and success. I once saw an episode of Celebrity Ghost Story, in which she described supernatural experiences in her NYC penthouse. Evidently, when she bought the place, in the 80’s, it was quite rundown. She said it had originally been the ballroom of the Drexel mansion, so it was a bit difficult to make it feel like a home. The place had apparently been an extravagant purchase. When she was first haunted by Mrs. Drexel, she was terrified, but didn’t think it would sell in its current condition, so she went ahead with the reno. She brought in a medium, who apparently spoke to Mrs. Drexel. The message from Mrs. Drexel was that she wanted to be honored in the house, and she wanted Joan to keep fresh cut flowers on display every day. Joan poked around the basement of the house, and found Mrs. Drexel’s portrait, which she proceeded to hang in the foyer of the building. She also honored the request for fresh flowers. Since then, the former lady of the house evidently still “visited” on occasion, but Joan took comfort in this presence, rather than being terrified. She said she felt the woman was at peace with Joan living there. Wow, what a story! Love that. Thanks, Alie! This home does not feel formal to me. Formal to me is when you are surrounded by furniture & accents that you are absolutely afraid to sit on or touch. (Donald Trump’s apartment is what you would call formal. It is decorated with gold on practically every surface and is so cold and uninviting). This home is approachable and feels very welcoming & comforting. 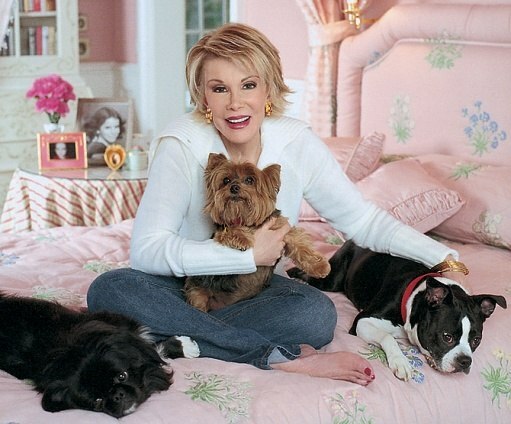 The fact that Joan is shown sitting on her bed with her 3 dogs highlights she is not stuffy or rigid in her choices of pieces of furniture in her home. I feel this home is decorated in a wonderfully, inviting way with absolutely beautiful pieces that showcase this lovely home. Of all the “celebrity” homes I’ve seen this is my favorite. Considering how many I’ve featured, that’s saying something! 🙂 I agree, it looks very homey to me, too. To be honest I never cared for JR’s style of humour but I sure do like her choice of country home and décor. I go for the house anytime and leave the apartment for Marie Antoinette. Hi Julia – Like you I’m Hooked on Houses to the point you wouldn’t believe! I couldn’t find a ‘contact me’ tab on your website so I’ve had to add this to the comments about Joan Rivers – but it’s not about Joan Rivers!!! I’m not on FB, Twitter etc either. My query is to ask whether you’ve seen the Richard Gere, Diane Lane film ‘Unfaithful’? Reason being, the house she shares with RG – it’s the kind of house you want to see more of and I wondered whether you were able to get any more screen shots as you are so good at those. You seem to be losing interest in your blog or am I wrong. Not at all. If anything, I care too much about it and spend way too much time working on it. I continue to turn down very generous offers that come in to buy my blog, even though the money is tempting, because I can’t imagine giving it up! A bit off-subject, but I just watched “Mr. Blandings Builds His Dream House” and I would love to know the name of Mrs. Blandings’ coffee server that she used in her new living room. She was serving her friend Bill (Melvin Douglas) Does anybody know what pattern this was or am I the only one who noticed it? Thanks. I love that movie! One of my favorite Cary Grant comedies. I’m afraid I don’t know anything about the coffee server, though. If anyone else does, fill us in! I watched the Joan Rivers/Bristol Palin edition of Celebrity Wife Swap (yes, I did, don’t judge me!). Joan “dressed for dinner” every night. Do you know if the program was filmed in her New York apartment or does she have a Los Angeles home, too? I thought the exteriors shown (for only a few seconds) looked more like an LA home. Since she was on the Red Carpet so often, I “assumed” that Fashion Police was filmed in her home studio in Los Angeles…but I probably made up that story. I missed that episode of “Celeb Wife Swap” but now I wish I’d seen it. Love that she dressed for dinner each night! I don’t know where they filmed that. Does anyone else know? During a break Rivers engages in conversation with the 30 or so “guests” on the set. Because the studio located in a nondescript office building that houses most of the E! operations is so tiny, there is not room for much of an audience. Since the show has become a hit in the U.S. and is shown in 160 countries, parent company NBC Universal has offered a much bigger studio on the Universal lot, Rivers says, but she won’t move from this studio where the show has been taped for three years. “I’m superstitious,” she says. It looks like 41 minutes so it’s probably the entire episode. …and you’ll see Joan in jeans, FISHING! Hi Julia, I’m a little bit country ….such a lovely home. Joan Rivers was a unique personality (irreplaceable). Thank you for sharing beauty. Regards Esther from Sydney. Wow! I love this country house. This lady had some serious bucks and it shows. I was so sad to hear of her passing, she was so full of life. It is a treat to see her barefoot in jeans in this post . Thanks for sharing her dreamy home . Rest in peace , Joan. I agree, it’s nice to see a more relaxed, at-home side of her in pics like that! Thank you for showing Joan Rivers’ Connecticut house again. I saw it a long time ago and never forgot the hallway transformation. I wanted to see it again and there it was. The changes were genius. I see that she added real windows and mirrors as well. Who but Joan could ever have thought of paintings of the homes of family and friends? Who but Joan could have gotten it accomplished? The hallway transformation is what I remembered most about it, too, Demeter, and was the reason why I had to look it up again. Loved it! Joan graduated from Barnard College with a degree in English Literature and Anthropology. I believe I remember her saying in an interview she was a big reader. Saw her in Kansas City in the 80’s . So quick and funny. I didn’t know about her degrees in English Lit and Anthropology. Interesting! Makes sense that she had so many books in her home. Thanks, Marsha! Actually, Bette Midler and Joan Rivers were not neighbors in the same building. In fact, their buildings were separated by a distance of nearly 2 miles. Joan’s magnificent home is located at 1 E. 62nd St., not far from the Central Park Zoo. Meanwhile, Midler’s exquisite home at 1125 Fifth Avenue, is a few blocks from 1040 Fifth Avenue, which was home to Jacqueline Onassis, near the Metropolitan Museum of Art. I wonder what the article meant by that then? I don’t think you can call someone who lives two miles away a next-door neighbor. Ha. Thanks, Marguerite! I’m sorry but I really don’t see how that Hallway could be the same Hallway. Maybe I’m naive – because I realize that with enough money, one can do anything. But even the dimensions seem off (maybe the photography) I realized, while first studying it, that they would have had to opened the one side up with windows that weren’t there. I can certainly see that – IF that wall opened to the outdoors. But then I realized the barreled ceiling and thought that seemed hard to believe. Just wondering if anybody else notice these differences that were a little hard to fathom. Joan had such class and style and lived exactly as SHE wanted to. I admire her for that and so much more. I really miss her! What a dame!